* You became a very steady sitter a month ago. You usually fall over only if you want to get somewhere. Then you roll and scootch until you get there. It's not uncommon to sit you down in one place to find that in two minutes you've made it clear across the room to something you had your eye on. * I'm nervous. A few days ago you were working on getting your booty up in the air and your legs under you. You are NOT allowed to crawl yet, okay missy?? * You are a tummy sleeper all the way. You scootch your way to a corner of your crib and sleep with your booty in the air. It's adorable. 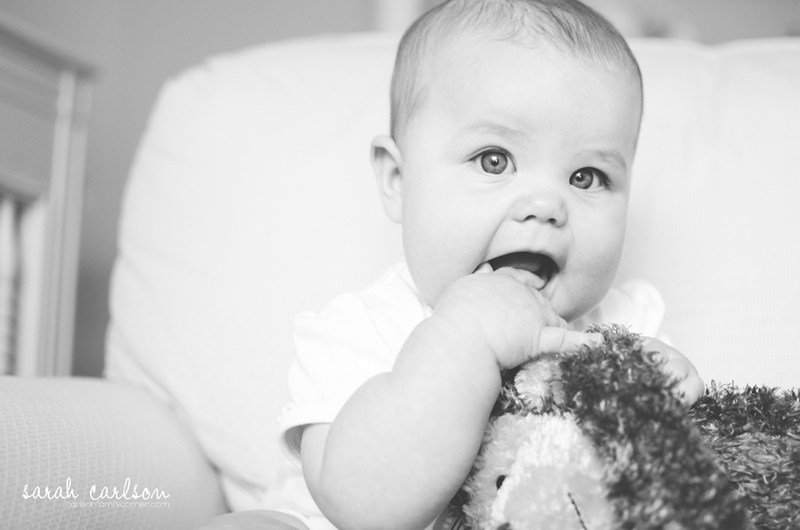 * You've been teething this month, and now we have proof! Your bottom right tooth is poking through, and the one next to it looks like it may come soon. * Meals are all still liquid for now. I keep trying solids with you, but you just make faces and spit it out. You'll get the hang of it. No worries! You take 4-5 bottles per day and you fluctuate between 5 and 8 ounces per bottle. You're still pretty hard to feed, and we sometimes have to work on your bottles for quite a while. We take lots of breaks and multiple attempts at your feedings. I really don't know how you weigh so much. It's the only difficult thing about you. * You adore your sister. You keep your eyes on her when she's around, and if she's close enough, you always want to grab at her. She's not a fan of that, though. You seem to smile more for her than anyone else, and she's not even paying attention to you! You sure watch her closely, though, and you are so interested in her toys! * When your hands aren't in your mouth, you're flapping your arms. It's a new thing you do. * Naps have been going great this month. You still take three a day, and you've been very consistent on the times and duration. I hope I didn't just jinx us. :) I put you down in your crib, you roll right over, find your thumb, and go to sleep. Love it. * You're in a grabby phase. You grab anything that's near you, and you especially love to grab our mouths and noses. Caroline, you are the most content baby ever. You are happy to play by yourself or be carted around and thrown off schedule. You never really cry, and you only fuss if you're really tired or hungry. I'm so thankful for this because my hands are pretty full! 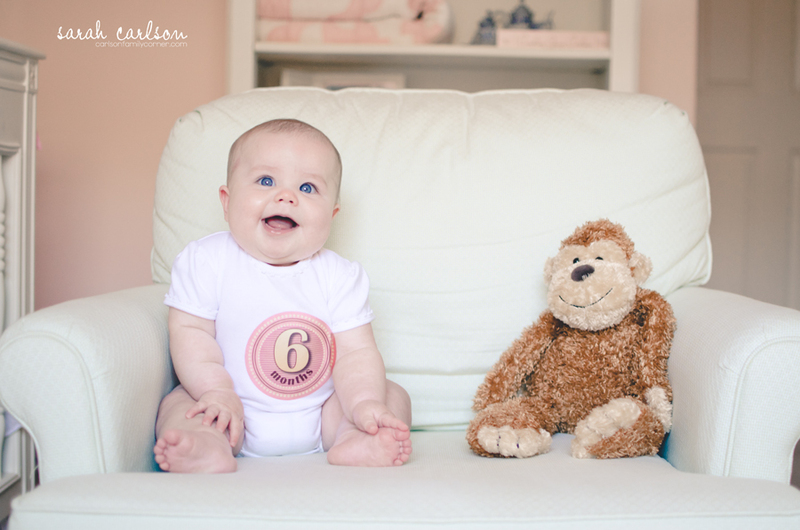 I can't believe you're already 6 months old. We love our little Monkey!